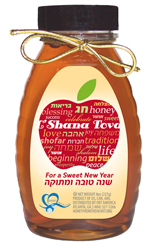 Wish your friends and family a sweet New Year by sending an 8-ounce jar of kosher clover honey in a personalized package, complete with a gift card and the blessing! Your cost is $12 per jar, and a portion of your purchase benefits CBI Sisterhood. Ordering online is fast, easy and secure. Go to www.orthoney.com/bia to place your order. And to make things even easier, honey orders placed last year are available on the web site for quick re-ordereing. Order online by July 11th to receive free shipping. After July 11th, shipping is $4.00 a jar. All orders placed by August 15th will be delivered by Rosh Hashanah. Orders are accepted throughout the High Holidays or until sold out. Contact Judy Mullinix at 512-626-3535 or jlmullinix@gmail.com if you have any questions. Please Note: If you experience any technical difficulties, please contact Judy immediately.